Plentiful marshes flush with waterfowl in the Sprague River Valley. Please join us in welcoming this special contribution from Portland-based graphic designer, tall bike builder, photographer and consummate adventurer Gabriel Amadeus. 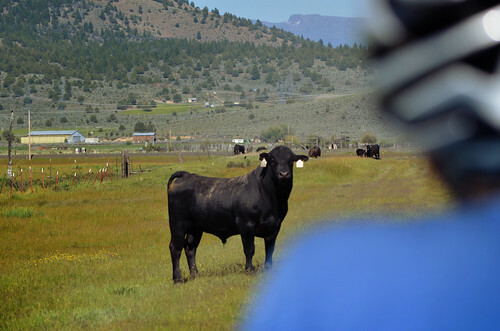 Gabe’s inspiring story and photos are brought to you in part by Treo Bike Tours, eastern Oregon’s new gravel and road-riding destination. 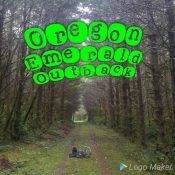 I didn’t even realize the Oregon Outback was a thing. 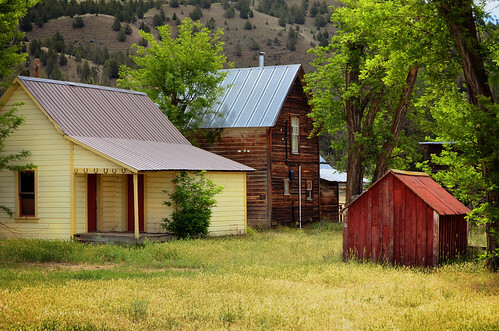 Up until last winter I hadn’t heard of places like the Sycan Marsh, Christmas Valley, or Fort Rock. I knew there were vast swaths of unexplored land between the Cascade Range and the Alvord Desert, but what I didn’t realize was just how gorgeous and varied this rugged country was. So when Donnie Kolb from Velodirt began some late night murmuring around a campfire about how he had found an almost entirely dirt and gravel route across the state, I didn’t really comprehend what he was talking about. It turns out you can take Amtrak south to Klamath Falls, just a few miles from the California border. From there it would be a lot of pouring over maps, sunburn, re-routing, sweating, and pure luck. 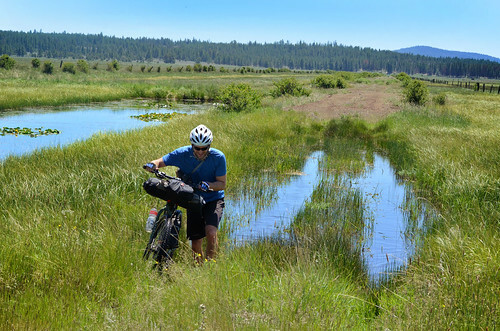 With Donnie’s recipe we’d follow the OC&E Rail Trail for the first 100 miles north into the Fremont National Forest, cross the arid Fort Rock Basin, head up and over the Ochoco Mountains, through Rajneeshpuram, and across familiar Wasco County to the mouth of the Deschutes River. Piece of cake. Or so it seemed. My personal bike camping essentials. Expansive view of Fort Rock and our route through the basin. 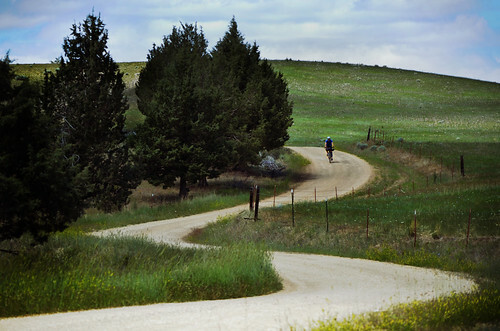 Gravel riding has exploded in popularity over the past few years. Usually free, non-competitive, somewhere between randonneuring and mountain biking. Sort of like cyclocross, but much longer. Gravel riding is definitely a masochistic endeavor. While folks have been pointing their bikes off the beaten path for decades, I think we can trace the gravel movement 10-ish years back to the midwest. 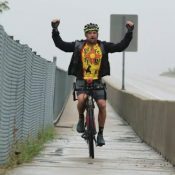 Rides like the Almanzo 100 attract over 1,000 riders while others like the infamous Trans Iowa and the Heck of the North have had to limit the number of riders who show up. I grew up in the midwest, and while they may not have mountain passes, they have their fair share of dirt roads and adventurous souls to find them. Here in the west the attraction is a bit different. It’s about avoiding the bike jocks and traffic, getting lost, finding something new, and not even thinking twice about packing a cold tallboy to share at the top. At least that’s why I do it. 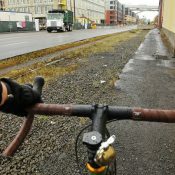 Velodirt is the premier source for those seeking an Oregon gravel fix. The organization’s longest running ride, the Oregon Stampede, just celebrated it’s 4th anniversary. When Rapha needed a course to film their elite continental team on a few weeks ago, they rode Velodirt’s classic Dalles Mountain 60. Velodirt rides are always welcoming, challenging, eye-opening, and decidedly at-your-own-risk. 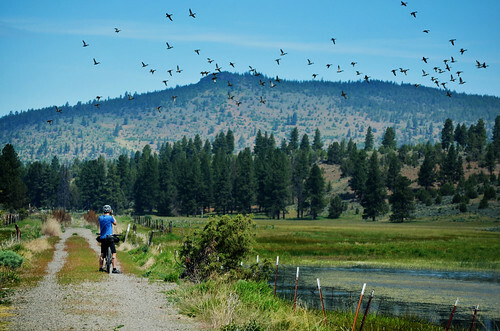 The first 8 miles out of Klamath Falls began according to plan on a smooth paved path. The next 58 miles were grueling. The OC&E trail hasn’t seen much upkeep or use since its construction in the 1990’s—at times the gravel would be too loose or the sage brush too thick to pedal through. At other times we’d have a hard-packed double track through marshes congested with waterfowl or have a hard time discerning the rail grade through a lush green cow pasture. We finally rolled into the National Forest and found a grassy stream bank. After a quick gravel scrub, some chorizo tacos, and bagged wine we settled down under the stars thinking… 300 more miles of this? Our second day we tackled the 12-mile wide expanse of the Sycan Marsh which the rail grade goes straight through. After a hot day of marsh wading and dusty gravel we were happy to find a creek to make ourselves somewhat presentable for our goal of the day: Cowboy Dinner Tree. Cowboy Dinner tree is a thing of fables. Generator run and nestled at the base of Hager Mountain, they’ve been serving up legendary meals for 21 years. 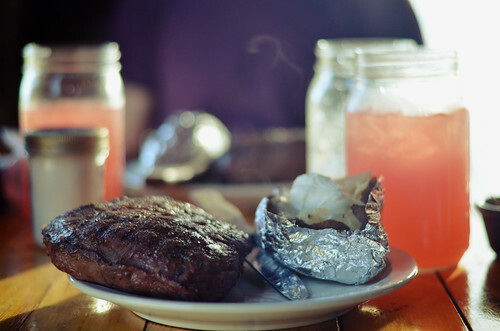 We walked into a sea of cowboy hats and pink lemonade as clouds of smoke billowed from the outdoor kitchen. A constant stream of first courses had us almost full by the time two of the largest steaks I’d ever seen got plopped down in front of us. We were asleep before it was even fully dark that night. Lots of cattle encounters near Sprague River. Some not so friendly. The wide, wet expanse of the Sycan Marsh. Cowboy Dinner Tree’s fabled 30oz steak. The Fort Rock Basin was our biggest worry of the trip. We had a full 80+ miles and an overnight to go with zero water. And I mean not one tepid, mosquito-filled puddle to pump from. We loaded up, and crossed our fingers. North past the intimidating Fort Rock itself and into a large OHV area where the deep gravel slowed our pace so that we barely noticed the heavy washboarding. The next day we finally descended into the Crooked River valley and sunk our feet in the hard-earned ice cold water. From there we re-stocked in Prineville and climbed into the Ochoco Mountains where we found a serene campsite at the base of Skookum Rock. In the morning we started a slow continuous descent along Trout Creek that had a constant supply of water crossings and fantastic views. After asking the postman and the school teacher in Ashwood, we realized we needed to re-route, so we climbed our steepest climbs yet and crested onto a rolling plateau of pastel grassland. The gravel road narrowed and began to grow grass between the tracks. The valleys opened up, the two-track meandered even lazier, and miles of painted hills receded into the distance on all sides. This was the best road in all of Oregon. 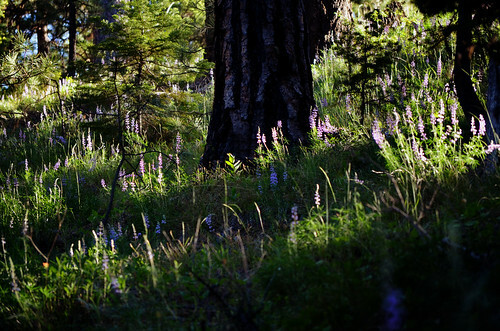 Alpine Lupine in the Ochoco Mountains. One of many stream fords in the North Ochoco’s. The roads outside of Ashwood are in no particular hurry to get you anywhere. It couldn’t last forever though, as it turns out the most of the businesses have shuttered in Antelope and Shaniko. We were happy to find some gas station food and a place to hunker down out of the wind for our last night. 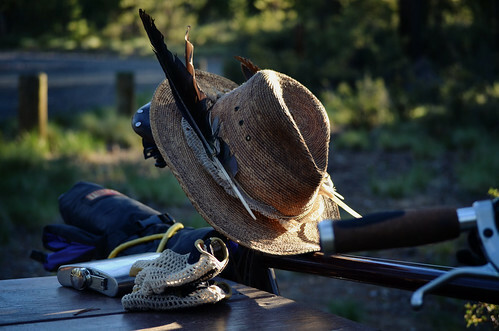 The final day was a lot of familiar riding as it linked up with the Oregon Stampede route. 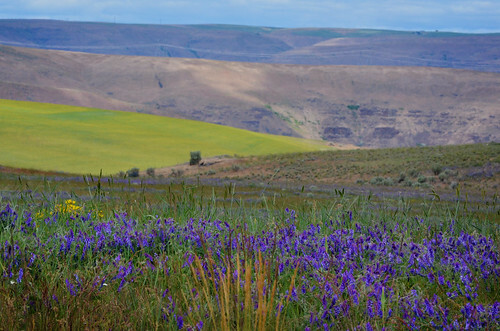 We were tired, smelly, and in a hurry to get out of the sun and wind so we got up early and pushed through the expansive rolling grass hills of Wasco County down to the free showers at the Deschutes River State Park. Wasco County’s hills are painted in pastels this time of year. Descending into the familiar Deschutes River valley on our final day. Donnie and I have done a lot of riding in remote Oregon and we were both surprised at how fantastic this trip was. The route, the logistical challenges, and especially the endless variations of gorgeous countryside really made it something extraordinary. We live in a special place folks, and it’s big. Get out there and find it! In fact, this route is so good there are rumors Velodirt will be throwing a bikepacking race along a version of it in May 2014. Keep your ears open. If you’re interested in the route we took check out the details via RideWithGPS. 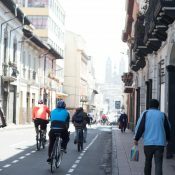 Donnie and Gabriel will be sharing more photos and stories from the trip this Thursday 6/27, 7pm at Velocult Bike Shop & Tavern (1969 NE 42nd Ave). This looks like a total blast!! This is one hell of an article. Testament to the talent that surrounds BikePortland.org. Awesome — I love it. Kudos to Velodirt for all it does. I’ve learned a lot of great riding areas from Velodirt. And this year’s Oregon Stampde was both the hardest and by far the best day I have ever spent on a bicycle. It was absolutely amazing and brutal. That bikepacking race along this route will be beyond epic. Bring it on! So. Good. See you guys Thursday at the slideshow!!! Awesome. 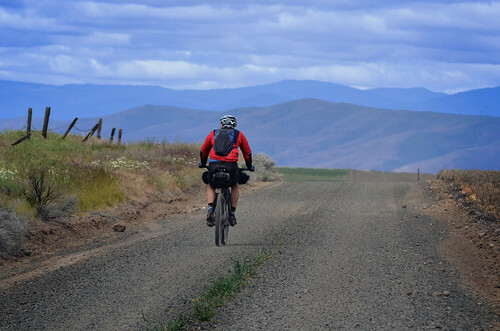 So many amazing touring possibilities in Oregon – I bet you could ride for an entire year straight and not get the slightest bit bored. thank you so much for sharing this, the pictures and the writing are both amazing. Awesome! See you Thursday. Can’t wait! What a fantastic adventure. I hope to make it to your presentation tomorrow! Also, keep us posted on the Velo Dirt ride if you do it. We’re coming out in September (we live in Central Massachusetts) and haven’t made any definite plans yet. Last year we rode the John Wayne Trail. Had a great time! Is there anyway you can share more information on how far you rode each day (we averaged 60-80 per day last year), where you camped, if along the way family members could meet up with us and how many total days you rode?? Awesome! We averaged 45-60mi/day. You could definitely do it faster, but the road conditions do really slow things down. Also food and water logistics sort of dictated where we spent each night. A lot of planning went into what stores were open and where we’d stock up on water each day. Donnie will be doing a gear and logistics post on Velodirt in the near future outlining all this stuff! One thing to consider is that September will be extremely hot and especially dry out there, it will be a very different trip in that regard. great pictures, very inspiring. what kind of bikes are you guys riding? Good question! Donnie was on a Surly Ogre rigid 29er with Revelate frame bags. He said it was the perfect bike. I was way out-gunned with my Salsa La Cruz running 35c tires. The road conditions were quite loose in places and I even had to walk some flat sections because I sunk in so deep. Looking at the pictures brought something to mind I just happened to have thought of just the other day. How somethings just become second nature, and quickly become habits… such as wearing a helmet. PS.. Great pictures, Great ride, Great article..!! Thanks to Danny and Gabe (and VeloCult) for the presentation tonight. Great stories and pictures and an awesome new bike route. Ashland and the Cowboy Dinner Tree are calling me. The Sycan Marsh, not so much. Thanks to everyone who packed Velo Cult last night! Woah GlowBoy, that looks awesome! I’ve been through some of those areas, just not on bike. Looks like a great trip!